Summer on a plate. That’s what we should call this. It’s just so… summery. It’s like taking a bigfat bite out of summer. A bigfat one. We’ve been eating a lot of salmon… well, okay, no more than we usually do but I like to be dramatic… but it’s weird because it’s Shark Week. You know, speaking of taking bigfat bites out of things. And we keep watching all this stuff about sharks because I’m three parts obsessed and one part terrified (or definitely three parts terrified and one part obsessed), and for some reason I relate sharks to salmon. Maybe because they are both in the sea? Who knows. I’m a wacko. But as we were eating salmon and simultaneously watching these rubbery creatures devour other much cuter rubbery creatures and reading this hilarious shark week post on thought catalog, I thought about how I am seriously convinced that any body of water holds a shark. Like lakes, rivers, streams… heck, I’m halfway afraid to go in a swimming pool by myself and close my eyes because I think a shark is magically going to appear and chew my legs off. It’s sort of like how I’m so afraid to hang my leg out of the side of the bed in the middle of the night, like out from under the covers, because I can just FEEL something coming up to bite it off. Anyway… I’m savoring every single moment of summer, even sharks and their entire goofy week. Even though yes, I’m craving fall spices and autumn just a tiny bit (it is my favorite season after all) and on Saturday morning, when it was 59 degrees outside and we took an early walk and it totally SMELLED like Fall and was lovely… I don’t want to see a lick of pumpkin for at least a month. Don’t want to hear about it. Don’t want to eat it. Don’t want to buy it. As soon as I finish eating grilled corn every second of every day, we can move on to that stuff. Let’s live up it, summer! So eat some of this. The salmon takes on lots of our favorite BBQ flavor and is perfectly crispy. Then topped with some bright and fresh sweetness and even a little spicy kick… we just couldn’t stop eating it. Which I guess is better than, say… not being able to stop eating ice cream. But I have no idea what that’s all about. In a bowl, mix spices, salt and pepper together until throughly combined. Rub spices over salmon (I actually just did one side because I tend to buy salmon that has skin on, so feel free to spread it out if your salmon is skinless.) evenly and place on a non-stick baking sheet or broiler pan. Broil for 6-8 minutes (for fish that is about one inch thick), turning once if desired. I actually prefer not to flip my salmon, as we love the crispy crust that one side gets. Serve immediately and top with pineapple salsa. This is really delicious over pasta with boatloads of butter… trust me I tried it. Words cannot express the incredibleness of that salmon. And the salsa? Duuuuuude. I need this in my life ASAP. Holy cow, that looks SO good! I’m sending it to my hubby. He’s BBQ Master @ the Zabo House. Im shoving this into my mouth as I type. Seriously good. Another awesome recipe, girl. Like usual. I made this the other night and it was amazing!!!! I could eat the pineapple salsa right out of the bowl! I am so excited to make this and so confident in your recipe that I’m going to make it for company. :) What in the world should I serve with it, though? I have only made salmon ummmm…one other time. I don’t really love it, but my husband does, and I want to. So, please advise, what will knock my guests socks off? Thanks! I would probably do some sort of rice or grain, like maybe wild rice or quinoa or you could even do roasted potatoes? And maybe some kind of sautéed zucchini veg dish? Ok, We love salmon, but the only way I can get it here in the boonies of Southern Indiana is frozen. Would this work out as well with the frozen salmon fillets I get at the grocery? Also, is the salsa made with canned pineapple or fresh? Or does it really even matter? I need some new recipes to add life to our salmon…I usually just broil it for a few minutes with lemon-pepper and butter on it. I am going to have to get on the ball and try some of yours…seriously drooling! I just came across your blog from Perfection Isn’t Happy. You have some really great dishes on here! I’m not generally a seafood fan but you’ve managed to make this salmon look delicious! Thanks for sharing! that salsa looks incredible! I wish we had shark week in the UK! umm thank you so much for this recipe! first time i got my husband and my three year old to eat salmon – and lick the plate clean! no leftovers! This will turn any salmon hater to love Salmon. This is the best ever. And the salsa is to die for. I made a tripple batch of the rub receipe so it will always be onhand. And make enough of the salsa to serve with chips… Yum Yum! I made this today, but without the salsa. And even without it tasted great! I want to make it with the really delicious looking salsa in the future. I ate the fish with pasta and as an appetizer I made your Strawberry Mango Basil Salsa on a dark brown baguette. Just lovely. Making food makes me happy and reading your foodblog really inspires me! Loved it. Thanks for another yummy meal. I can’t thank enough for this recipe. I absolutely love fish (but salmon is my least favorite, however my hubby loves it). This dish was amazing. 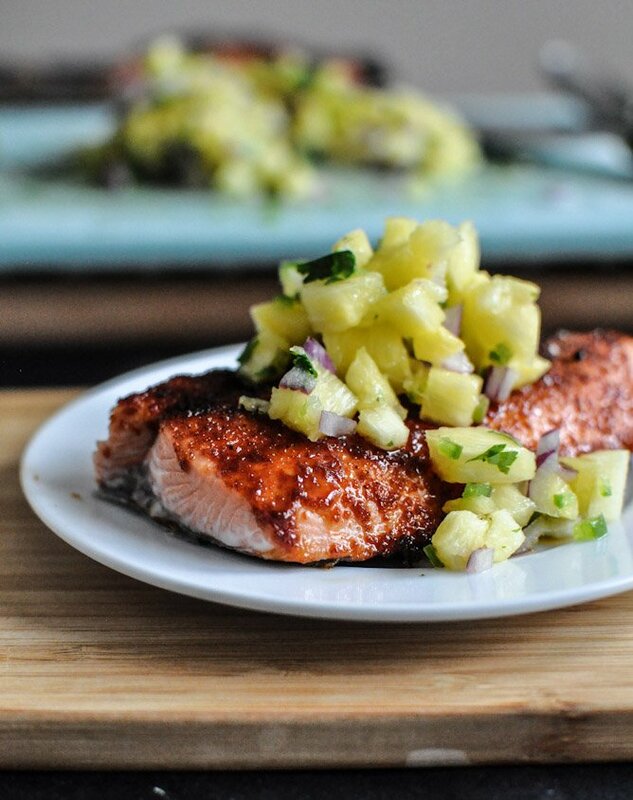 I loved the flavored the salmon took on with the BBQ rub, and the pineapple/jalapeno salsa was incredible! THANK YOU THANK YOU THANK YOU! Made this tonight – 1 word – YUM! Made this a few nights ago and it was picky eater approved! My brother, who never trys my cooking, was circling like a vulture for left overs and insists i make it again SOON. Highly Recommend. So fast and simple! I made this tonight and it was delicious. I even got risky and doubled the jalapeño. Perfect!